I know that to everything there is a season, but I’m a gardener and I start counting the day s until spring the day after Christmas. I live and grow in Zone 5b where I care for BLOOM THYME, my large garden of roses and their companions. I am an active member of the Indianapolis Rose Society currently serving as President and the American Rose Society, where I currently serve as district director and Roses & You editor. 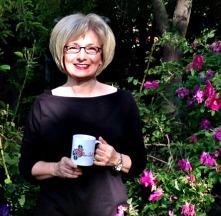 I am also a master gardener and enjoy the many opportunities to learn and to help others grow! I make an annual pilgrimage to Asheville, NC to serve as juror of the Biltmore International Rose Trials. I LOVE to dig in the dirt … dirt has an almost magical effect on me. 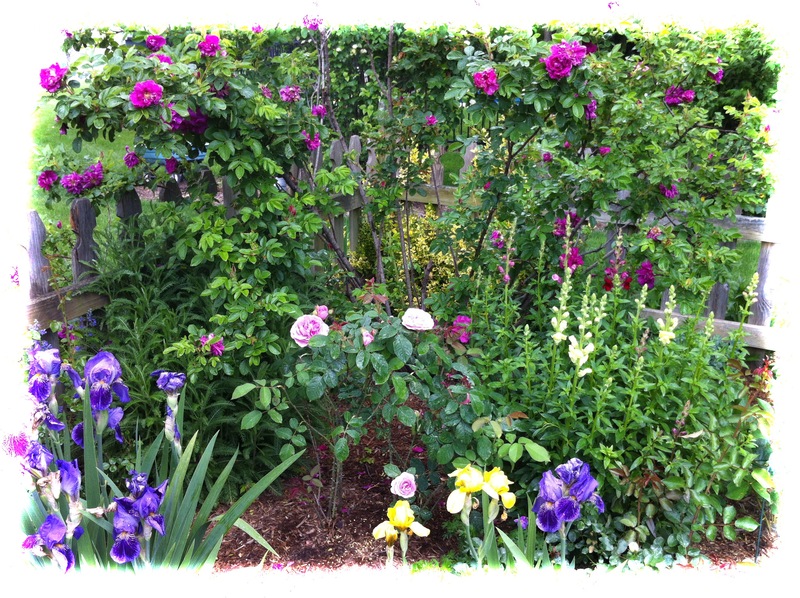 I LOVE roses and get completely giddy when it is time for my roses to bloom in early June. I want to help others have the garden of their dreams. I LOVE to create flower arrangements to share! I LOVE to share my garden with others. I LOVE to speak to garden clubs and at garden related events. Contact me here or via my email here. My blog tells of my adventures in the garden and in life, as well as promotes roses as an integral part of the landscape. My very handy husband (the builder of fences, potting sheds, trellises, etc.) and I spend most of our free time tending our garden and caring for the birds, frogs and various other critters that join us. So, if you are interested in gardening, roses, flowers or if you find anything magical about dirt, I’d love to have you follow along. Glad you liked the photo and article Teresa! I love your site as well! Stumbled on your blog by accident so glad I am . When physicaaly and mentally able gardening is a hobby of mine I started last summer. Already I found some new information, I will pop im often! WOW!!! I am truely blessed! Aren’t you sweet! Thank you for your kind words about my me, my blog and my garden! Your blog is FUN, FRIENDLY and one of the FIRST I read! Many, Many THANKS! Wow! Is that purple roses? awesome! Sylvia, Thank you so much for sharing your story with me — just completes the circle for me. So glad to know that the Lester were just as I imagined them to be. I’m sure the garden was an enchanting playground. You make it so much more real to me! I have been drawn into Francis’ love or the rose with his writing and I can see your dad was not immune to his enthusiasm either! HA! Roses are just the best hobby! I wish you all the best. Keep in touch! Your site is so very beautiful. I live in Maryland in zone 6-7 (I say both because we are technically in 7 but live on a higher hill which causes more wind and cold up here. I was wondering what state you live in and if you have hot and humid summers like we do and therefore have problems with roses. (Although it sure doesn’t look like you do.) 🙂 When my Daddy in Annapolis was alive had many gorgeous roses but it required a lot of spraying – is that what you need to do too? Thank you so much – I am in the middle of canning applesauce and this site was a joy to just take a break and sit and savor. Hello and thanks for stopping by! There are many roses today that require little or no spray! I am in zone 5b and could make some recommendations if you like. You’ll see the experiments I did and the results … just google “Organic Roses” and you’ll see my posts in Gardenweb. Feel free to pass on the info. in “Organic Roses Forum” to others. I posted the info., after offering free roses to friends & neighbors and no one want them, citing that roses are too fussy and need spraying. So glad you stopped by my blog. I look forward to reading your articles and will head over to your blog! Thanks Cathy. It’s just a back yard garden that I photograph a lot! LOL and it has wonderful season (like spring) And drab seasons like July and August. 😉 We haven’t done many official tours but our rose society and master gardener groups come. We love to share. Again thanks for your sweet words. Do you have a garden? Your roses are beautiful. I grow roses in Atlanta. Your growing season will start a lot sooner than mine. Enjoy!! 🌹Thanks for stopping by! Yes we will be doing our pruning soon. As we say down here in the South, “Bless your heart darling” ☺ I wish you an early spring. Though I am not by any means a native Southerner but I love it down here and the people too! Yea! Your garden looks stunning, I’m so jealous. Can you come and look after mine lol. As all gardens, mine has good seasons and not so good seasons! That’s what keeps us interested!! You have huge amount of very beautiful roses. Nearly two years ago we moved from our countryside house to a small town. My wife had small flower garden with different flowers including roses. Because roses require a lot of care, I appreciate Your beautiful rose garden. Roses in our Northern garden. Hello Teresa I along with the group “Tuesday with Friends”,had the pleasure of your guided tour of your garden… I just wanted to say how much I enjoyed it, and your knowledge and love of your Roses was most impressive. I also was the person that took your photo with Colletta. Linda, it was so nice to meet you and I am glad you enjoyed your time in the garden. It was wonderful to have you! I’ve been following you on Instagram for a while and am happy to find your beautiful blog. I’m an amateur gardener in zone 6a and find so much joy, stress relief, recreation, exercise… you get the picture… from digging in the dirt. I can relate so well to what you’ve written here. We’ve had our first snow of the season today, so it’s inside I go to plan for next year. I’m enjoying your lovely posts. Hello Tina, So glad you stopped by. Yes, there is power in dirt!! !